This chapter describes the changes that need to made with in the Exchange Management Console to integrate ADFS authentication. In order to integrate ADFS and OWA, OWA must be configured for windows integrated authentication. Open the Exchange Management Console (EMC). Navigate to Client Access menu. Click on the Outlook Web App tab. Go to the properties of the deployed site. Click on the Authentication tab. Select the "Use one or more of the standard authentication methods" radio button. 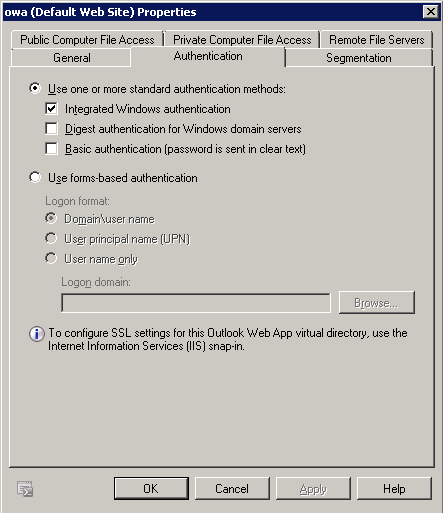 Then only check the Integrated Windows Authentication checkbox. Press 'OK' to complete the change. Apply the previous directions to the Exchange Control Panel (ECP) site.